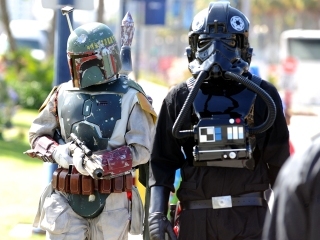 Two people dressed as Star Wars characters are seen in this Getty file photo. There may be an outbreak of Chewbaccas, Darth Vaders and Luke Skywalkers around the region this Halloween. The Bay Area has searched for Star Wars and superhero costumes more than any other Halloween outfit, according to Google Trends' Frightgeist experiment, which allows users to search for top trends this holiday. A pirate, Minnie Mouse and Batman round out the region's Top 5. It's not far off from the nationally trending costume ideas, with one notable difference: Batman's foil Harley Quinn is the top searched costume in the United States, followed by Star Wars, superhero, pirate and Batman.